BSE Sensex closed higher by 91.71 points, or 0.27%, to 33,880.25, while the Nifty 50 gained 22.90 points, or 0.22%, to close at 10,402.25. BSE MidCap was up 0.16%, while SmallCap edged down 0.02%. Sixteen out of 19 sectoral indices on BSE ended higher led by metal 2%, realty 1.25%, capital goods 1.08% and bankex 0.93%. Axis Bank, ICICI Bank, Adani Ports and Tata Steel were top gainers, whereas Tata Motors, M&M, Hero MotoCorp. and HCFC were among the major losers. Reliance Infrastructure Ltd said the Delhi High Court has directed Delhi Metro Rail Corp. to take over servicing of all debt liabilities of Reliance Infra unit Delhi Airport Metro Express Pvt. Ltd amounting to Rs1,618 crore. Reliance Infra shares were trading 2.42% up at Rs462.90. BSE Sensex traded higher by 123.25 points, or 0.36%, to 33,911.79, while the Nifty 50 gained 33.85 points, or 0.33%, to 10,413.20. Cyient Ltd said the company has merged its unit Techno Tools Precision Engineering Pvt. Ltd with its holding company Cyient DLM Pvt. Ltd. Cyient shares were up 0.75% to Rs638.40. Swan Energy Ltd said unit Triumph Offshore Pvt Ltd has executed a ship building contract with Hyundai Heavy Industries Co. Ltd for the construction of a floating storage and regasification unit vessel for LNG port project of Swan LNG Pvt. Ltd. Swan Energy shares were down 1.86% to Rs176.65. The State Bank of India (SBI) has announced the launch of its UK subsidiary, SBI (UK) Ltd, with an initial capital commitment of £225 million from its parent entity. SBI, which celebrated the new subsidiary with a special event in London on Monday, becomes the first foreign bank in the UK to ringfence its retail division from its wholesale business. 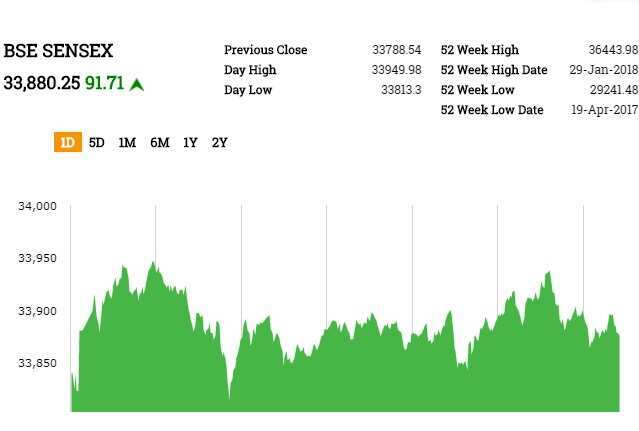 BSE Sensex traded higher by 77.89 points, or 0.23%, to 33,866.43, while the Nifty 50 gained 19.25 points, or 0.19%, to 10,398.60. Among the sectoral indices on BSE, metal, bankex, capital goods and basic materials were trading higher, while auto, telecom, consumer discretionary goods and services declined. BSE MidCap inched up 0.06%, while SmallCap edged down 0.02%. 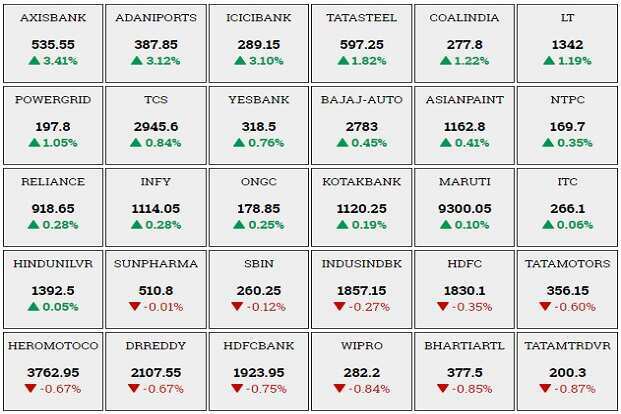 Axis Bank, ICICI Bank, Adani Ports and Tata Steel were top gainers, whereas M&M, Hero MotoCorp, HDFC Bank and Dr. Reddy’s Labs were among the major losers. Minda Industries Ltd said its board has approved the acquisition of a 41.67% stake of Toyoda Gosei Minda India Pvt. Ltd. Minda shares were trading 0.28% lower at Rs1123.50. Welspun Corp. Ltd shares jumped 2.36% to Rs145.20 after the company said it has received a contract for supply of 417,000 MTs of large diameter pipes for a water project in the MENA Region. Oil markets rose by more than 1% on Tuesday, extending strong gains from the previous session, on hopes a trade dispute between US and China may be resolved without greater damage to the global economy. Brent crude futures were at $69.62 per barrel at 12.21pm, up 96 cents, or 1.4%, from their last close. US West Texas Intermediate (WTI) crude futures were at $64.31 a barrel, up 89 cents, or 1.4%. The gains followed a more than 2% rally on Monday, but that was a rebound from a 2% decline on Friday. BSE Sensex traded higher by 82.01 points, or 0.24%, to 33,870.55, while the Nifty 50 gained 18.60 points, or 0.18%, to 10,397.95. Asian shares rose alongside oil and metals and Treasuries extended losses with gold and the yen. Xi said Cold War and zero-sum mentalities were “out of place,” and backed free trade and dialogue to resolve disputes in his keynote speech Tuesday to the Boao Forum for Asia, Bloomberg reported.Japan’s Topix index rose 0.4 %, while South Korea’s Kospi index added 0.2%. Hong Kong’s Hang Seng Index gained 1.1% and the Shanghai Composite Index climbed 0.3%. Dr. Reddy’s Laboratories Ltd said it has received an establishment inspection report from the USFDA for its API Cuernavaca plant in Mexico. Shares traded 1.23% down at Rs2095.75. BSE Sensex traded higher by 104.59 points, or 0.31%, to 33,893.13, while the Nifty 50 gained 26.05 points, or 0.25%, to 10,405.40. Among the sectoral indices on BSE, metal gained most at 1.44%, capital goods 0.94% and bankex 0.77%, while telecom was down 0.58%, oil and gas 0.46% and auto 0.33%. BSE MidCap and SmallCap gained 0.17% and 0.18%, respectively. Chinese President Xi Jinping reiterated pledges to open sectors from banking to auto manufacturing, in a speech that also warned against returning to a “Cold War mentality” amid trade disputes with US counterpart Donald Trump.Xi pledged a “new phase of opening up” in his keynote address Tuesday to the Boao Forum for Asia, China’s answer to Davos. While the speech offered little new policy, Xi affirmed or expanded on proposals to increase imports, lower foreign-ownership limits on manufacturing and expand protection to intellectual property—all central issues in Trump’s trade gripes. Axis Bank shares rose 2.3% to Rs529.65 after its board approved request to cut managing director and chief executive officer Shikha Sharma’s term. She will leave now on 31 December. Sharma’s fourth term as MD and CEO, which was granted last year, was originally set to end in June 2021. Metal stocks were trading higher after US sanctions on Russian tycoons. Hindalco Industries Ltd rose 5%, National Aluminum Co Ltd rose 4%, Vedanta Ltd 2.2%, Steel Authority Of India 1.4%, Tata Steel Ltd 1.2%, JSW Steel Ltd 1.1%, NMDC Ltd 1.1%, Jindal Steel and Power Ltd 1%. Wipro Ltd shares fell 2% to Rs279 after the company said in a notice to BSE that the bankruptcy of telecom operator Aircel Ltd will hit Wipro Ltd’s March quarter profit by up to 75 basis points (bps) and also hurt revenue growth. The Indian rupee strengthened against US dollar tracking gains in Asian currencies market. The rupee opened at 64.88 a dollar, and was trading at 64.90 a dollar, up 0.22% from its Monday’s close of 65.03. The 10-year bond yield was at 7.247% compared to its previous close of 7.226%. Bond yields and prices move in opposite directions. BSE Sensex traded higher by 115.43 points, or 0.34%, to 33,903.97, while the Nifty 50 gained 34.45 points, or 0.33%, to 10,413.80.